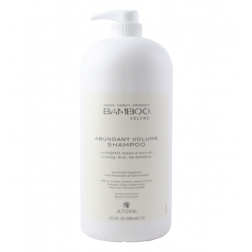 Alterna Bamboo Abundant Volume Shampoo 33.8 oz. 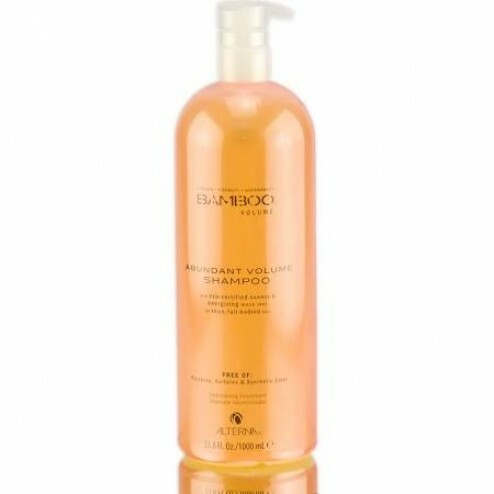 Bamboo Abundant Shampoo combines strengthening pure Organic Bamboo Extract and stimulating phyto-nutrient rich Organic Maca Root in a gentle sulfate & sodium chloride free formula. 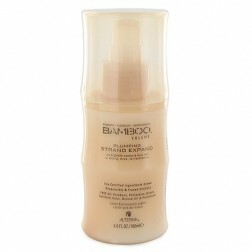 Organic Bamboo Extract: Immediately boosts hair’s intrinsic strength flexibility and sustainability for stronger healthier better-performing hair. Organic Maca Root: Invigorates & energizes hair from the inside out helping to improve volume on three dimensions: fullness thickness and lift. Massage throughout wet hair and scalp. Rinse thoroughly. 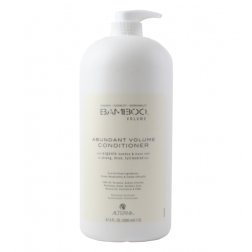 Follow with Alterna Bamboo Abundant Volume Conditioner for optimal results. L-O-V-E! Awesome ingredients. Great volume. Color safe. Smells amazing! Water (Aqua) Cocamidopropyl Betaine Disodium 2-Sulfolaurate Sodium Methyl 2-Sulfolaurate Cetrimonium Chloride Sodium Methyl Cocoyl Taurate Bambusa Vulgaris Water Wasabia Japonica Root Extract Bambusa Vulgaris (Bamboo) Extract Lepidium Meyenii (Maca) Root Extract Panthenol Glycerin Helianthus Annuus (Sunflower) Seed Oil Hydroxypropyltrimonium Honey Paullinia Cupana (Guarana) Seed Extract Serenoa Serrulata Fruit Extract Hydrolyzed Vegetable Protein PG-Propyl Silanetriol Hydrolyzed Soy Protein Rice Amino Acids Hydrolyzed Cottonseed Protein Silicone Quaternium-8 Lauramide MEA PEG-150 Distearate Methyl Gluceth-10 Polyquaternium-55 Silicone Quaternium-16 Amodimethicone Sodium Benzo ate PEG-120 Methyl Glucose Dioleate Panthenyl Hydroxypropyl Steardimonium Chloride Undeceth-11 Linalool Butyloctanol Disodium EDTA Undeceth-5 Aminomethyl Propanol Limonene Phospholipids Methylchloroisothiazolinone Methylisothiazolinone Polygonum Multiflorum Root Extract Azelaic Acid Calcium Pantothenate Calphostin C Magnesium Ascorbyl Phosphate Magnesium Salicylate n-Carboxyethyl Butyric Acid Niacin Ornithine Decarboxylase Phosphorus Retinyl Palmitate Threonine Tocopheryl Acetate Zinc Gluconate Polyquatenium-10 Silanetriol Melaninate Superoxide Dismutase Hydrolyzed Pearl Bromelain Papain Fragrance (Parfum).